Backpacker Magazine reviews the Bemco® Backpacker 7” Deluxe Oven Kit This lightweight camping oven can cook like a normal oven, above 14,000 feet!’ Read the review on the Backpacker web site. The Continental Divide Trail Alliance had an opportunity to do a first round testing on the Bemco Backpacker Oven during our crew chef training in El Malpais National Monument, in NM. Our chefs in training were fascinated by the compact oven, the simplicity and beauty of the design. The oven was lighter than we expected, far lighter than ovens we have packed in the past. We used the 9" kit to make several rounds of buttermilk biscuits, each round coming out consistent, as good as if you cooked it at home. They were delicious, and we are all looking forward to testing more recipes, and baking on future volunteer projects. Thank you Brian for being such a wonderful supporter of the CDTA, we'll be in touch with future reports! NM Field Program Coordinator Continental Divide Trail Alliance. Used the oven in the Boundary Waters with an MSR Dragonfly. It worked great! Pizza was delicious, biscuits and gravy, cornbread, muffin cake - it all turned out delicious. We got better the more we baked. I learned that it is better to “build up” rather than “take down” the temp; then it was easier to maintain an even temp. I used alligator clips on the rivets that the front attaches to because the front fell off on one trial. Not a big deal. This is a great product. Somehow I lost the little spring for the door, but I don't think that interferes with function. The door might have been an operator error — was clumsy that attempt. Thanks. I wish my water filter would have worked like your oven did. I bought a 9” oven from you back in April and I just wanted to tell you how much I am enjoying it. I have a lot of experience with an Outback Oven and there is no comparison in performance between the two. Your oven works like a conventional oven and I have never burned anything in it! I can't say that about the Outback Oven. I did a side by side test, Backpacker Oven versus our kitchen oven. 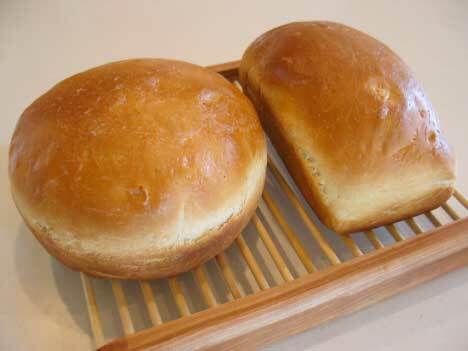 I mixed up a 6 cup recipe of buttermilk yeast bread and divided it into 2 loaves. One went into my wife's Kitchen Aid oven and the other into my 9” Backpacker Oven. Both ovens were preheated to 400 deg. F. I removed the top rack in the Backpacker oven to give more room for the loaf to rise. The recipe called for 400 deg. F. for the first 10 minutes and then 350 deg for 20 to 25 minutes. It was easy to check the progress of the bread in the Backpacker Oven by looking through the top vent hole with a flash light. That way I didn’t have to open the door and let the heat out of the oven. I was really surprised that both loaves finished baking at exactly the same time. 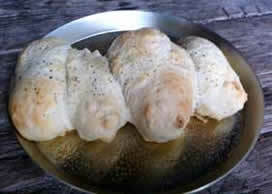 I have attached a picture of the bread so you can see how they came out. The round loaf was baked in the Backpacker Oven. I have tried the same baking test with cookies. While my wife baked cookies in her oven, I baked in the Backpacker Oven at the exact same temperature. Cooking times were identical and so was the appearance of the cookies. In fact you couldn't tell them apart if they were put on the same cooling rack. I baked a brownie mix ”Duncan Hines Chocolate Lovers Brownies, Double Fudge”. The 17.6 oz box is intended for an 8x8” pan but works fantastic in the 8” round. The baking time was exactly what the box said for a conventional oven. What amazes me is that I can bake two of these at one time in the 9” oven. Im really impressed with the Backpacker Oven. The 9” oven will easily bake enough food at one time to feed my family of four. While I bought it primarily for using on our salt water boat, I think it will see a lots of car camping or it might even go on my next canoe trip. Thanks for producing such a fun product and also for the awesome customer service. just to let you know, I’ve had a play with your oven and must say i'm VERY IMPRESSED. I did read a bad cyclist's review somewhere online but the majority of reviews seemed good, so i went ahead. Boy am i happy! I wrote a little bit about it on my local forum: Read it here! Just last week I picked up a second-hand Outback oven from a friend and had a thorough comparison with yours, and I had better results with your oven on my optimus stove. Just to let you know I’ll be buying another bigger oven from you soon for car camping. You seriously need to market this into Australia. Theres nothing like it at all in any camping store Australia-wide. 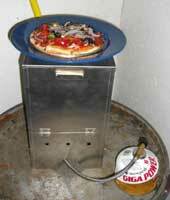 The oven works fine on our alcohol stove a CookMate model 3100. Our boat is a classic - a 1977 Catalina 27' built by Catalina Yachts. We discovered that we can hold the oven steady with the pot clamps on the inside of the backpacker oven. I still wouldn't try it in high seas until we rig an extra set of clamps for it, but I think it would do well at anchor. Attached is a photo of our first trial. Just wanted to let you know that I recently ordered your oven and last weekend I used it in 12-degree weather to bake some pierogis. They turned out fantastic! I just received the 9" oven the other day. I love the craftsmanship. Handmade metal craftsmanship is becoming a lost art. Hopefully I can crank out a trip report in the next month or two. Backcountry pizza and cinnamon rolls will be the first attempts. I'll have to be careful to not invite any bobcats or their larger cousins. P.S. Nice work on the shallow pans. I'd just like to report that the oven works just as described, and when cooking for Boy Scout adult leaders, you don't want to leave the baking to chance! I turned out some excellent biscuits for my patrol during Wood Badge training, and some delectable brownies during the fall camporee. All the adults were impressed! The shipping was very fast! My oven was shipped on Friday, received on Monday. Thanks very much. Just wanted to write a quick note about the oven. I was skeptical of how it would work using only the alcohol stove I purchased from you with the oven. I liked the size of the stove, but it didn't look like it would put out enough heat. Well, at 12000 feet my 8-yr old son and I set it up outside our tent and proceeded to make pizzas. Lighting an alcohol stove in bright sun is tough because you can't see the flame, but once we knew it was going we moved on. Oven hit 500 degrees in a few minutes and the pizza cooked for probably 6-8 minutes. Golden crust, perfectly melted cheese, I was shocked. We had brought ingredients for only two pizzas because we thought this would be such a hassle it wouldn't be worth making more, that was not the case at all. So I am very happy with the oven and even with the small alcohol stove, it seemed to put out the exact amount of heat and even if I brought another stove for general cooking, I still would have used this one for the oven, it's so simple, fill it up, light it and forget it. I’ve used the oven several times now baking all kinds of muffins and cookies. Everything was great; perfectly browned top and bottom! Just like a real oven. Sure beats the heck out of those stove-top potato bakers others are selling as backpacking ovens. I’ve used it with my Simmerlite, Primus Multi-Fuel, and Primus Omni Fuel. The Primus stoves just fit under the oven (the legs make it a tight squeeze). The Primus Omni-Fuel works the best by far. It is really easy to regulate to a simmer, even with white gas.Have you had tried the oven with a Trangia alcohol burner? If that worked it would be way cool for the alcohol packers. I think you've done quite well in the design of this oven! It's one of those things you can't believe someone hasn't done before. I hope you sell a million of these things. The price of just under $40, is a great value. Very light, packable, and rugged, it will stand up to the rigors of motorcycle camping (single track stuff is tough on equipment). I'm going to have pizza at 14,000 ft somewhere on the Continental Divide Trail ... thanks to your oven. All said and done, if I have extra $$ after payday I may buy another to give to my son as a Christmas present. We posted a review of the Backpacker Oven on the blog today: PackItGourmet. We thought it was a great little oven! We’re looking forward to testing it out with a cake or maybe some cookies next. Please let me know if you'd like me to send you any of these photos. I took quite a few so if there’s another type of photo you’re looking for, let me know and I’ll see if we have one. The weekend went well, just a little wet along the Upper Winter Creek and Gabrielino trails. The oven performed well and got a lot of use in making four 6" pizzas, a dozen cookies, and 8 orange cinnamon rolls. I took pictures of the pizzas and the cookies, but the breakfast rolls went so fast I didn’t get pictures! I used the Betty Crocker pizza dough and Boboli sauce packet for the pizzas. Each dough mix packet made 2 pizzas and I was able to make the 4 pizzas with just one sauce pack. The adults and boys loved the baked goods. I'm glad to have a new dimension in backpack cooking. Here are photos of the awesome food I can now produce using your oven; you da man! Last Saturday I used the oven for the first time on a twenty mile hike with Scouts. They used an MSR Whisperlite with the oven baking biscuits, corn bread and brownies. (They mixed them in the two pans included in the kit.) The oven goods were great: nothing burned. Next time they will remember to bring some oil and butter buds! Oh, I did not receive a simmer ring for the alcohol stove, haven't tried it yet. P.S. Thanks for the videos on YouTube.